This guided inquiry activity uses a modified version of the Science Writing Heuristic to give undergraduate students an opportunity to refine their use of the scientific method and analytical skills while learning about the factors that influence a regions temperature. 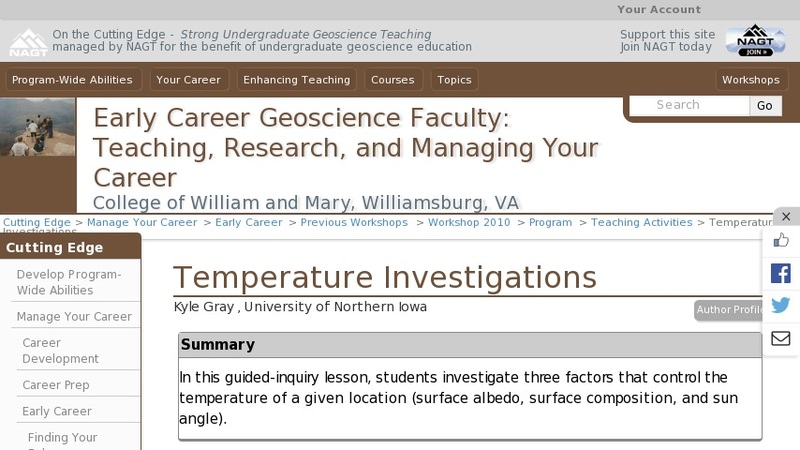 Student groups design three sets of experiments that investigate how temperature is affected by: 1) surface albedo; 2) sun angle; and 3) surface composition. For each investigation, the students must develop a research hypothesis, identify the corresponding variables, design and execute an experiment, analyze data, and communicate their ideas to their peers.